Today I have a secret recipe for a healthy dish served at The Cheesecake Factory. The Santorino farro salad is a light and fresh combination of farro, cucumbers, tomatoes, beets, red onion, feta cheese. This salad is tossed in a light vinaigrette and served with tzatziki sauce on the side. Line a platter with the cooked farro. 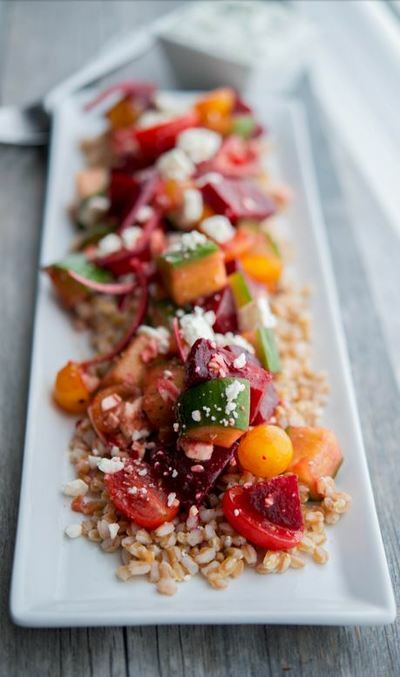 In a bowl, combine the cucumbers, tomatoes, beets, onion, feta, vinegar and oil; mix well and place on top of the farro. Serve with Tazatziki Sauce on the side. Combine all ingredients in a bowl and mix well. Keep chilled in refrigerator until ready to use. Can be made up to two days beforehand. Today I have a secret recipe for a hearty pasta dish served at The Cheesecake Factory. Bow tie pasta is tossed with chicken, bacon, mushrooms and sun dried tomatoes in a rich and creamy sauce. This flavorful dish is guaranteed to a be a hit at your dinner table. If you haven’t cooked the pasta, cook it now according to the directions on the box. Cut the chicken into 1″ cubes and season with kosher salt and black pepper. Today I have a secret recipe for a yummy new cheesecake serve at The Cheesecake Factory. If you love Funfetti cake, then this new cheesecake is going to blow your mind. Aptly named the Celebration Cheesecake, this colorful cake features layers of Funfetti cake, cheesecake, and multicolored layers of buttercream frosting. This cake is perfect for a birthday or any celebration. Heat oven to 350 degrees. Grease 2 9-inch baking pans then line with parchment paper. In the bowl of a stand mixer beat the butter, sugar and brown sugar until creamy. Add the egg, milk and sour cream and mix well. Add the vanilla and mix. Add the flour, baking powder, baking soda and salt and mix until blended in. Divide the batter between the 2 cake pans. Bake for 30-35 minutes until cakes are golden and done when a wooden skewer inserted in the middle of the cake comes out clean. Let cakes cool in the pans for 10-15 minutes then carefully invert to a cooling rack to fully cool. For the cheesecake layer, lower the oven to 325. Grease a 9-inch cake pan then line with parchment paper. In the bowl of a stand mixer cream the butter with the sugar using the paddle attachment. Add in the cream cheese a bit at a time until fully incorporated and smooth. Add the eggs one a time. Mix in the pudding and baking powder until blended in. Bake for 55-60 minutes until the top is set and golden. Let the cheesecake cool then cover the cake pan with plastic wrap and foil and place in the freezer until frozen. When the cheesecake is ready to assemble prepare the buttercream. In the bowl of a stand mixer beat the butter with the whisk attachment until light and fluffy. Add the confectioner’ sugar a bit at a time until incorporated. Add the cream and beat until fluffy. Evenly divide the buttercream into 3 bowls. Tint one pink, tint one blue and leave one white. Place one cake layer on a cake stand or plate. Frost with the blue buttercream. Remove the cheesecake from the freezer and remove from the cake pan. Place the cheesecake layer on top of the cake layer and frost with the pink buttercream. Add the second cake layer on top and frost with the white buttercream. Top with more rainbow sprinkles. Keep cake chilled and bring to room temp to serve. 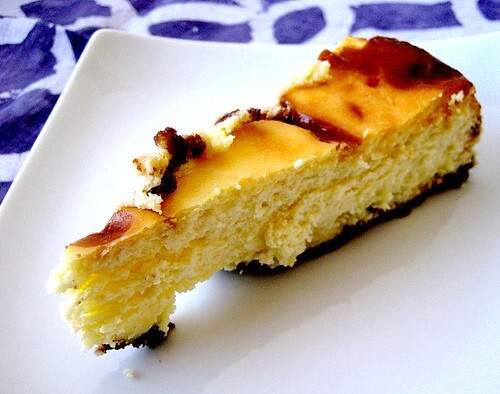 Today I have a secret recipe for a luscious cheesecake served at The Cheesecake Factory. Creamy cheesecake is swirled with white chocolate and raspberry on top of a chocolate graham cracker crust. After one bite I think you’ll agree this is the best cheesecake ever. 1. Preheat oven to 475. Create a water bath by placing a large pan filled with about a half a cup of water into the oven while it preheats. Before you do this, though, make sure your springform pan fits into the water bath pan. Otherwise you’ll be in for a fun surprise in a few steps. 2. Combine the raspberry preserves with a 1/4 cup water in a microwave safe bowl and microwave for 1 1/2 minutes. Stir until smooth. Strain to remove the raspberry seeds, then let cool. 3. Measure 1 1/2 cups of chocolate cookie crumbs into a bowl. Pour the melted butter into this bowl and mix. Press the crumbs into a 10-inch springform pan. Wrap a large piece of foil around the bottom of the pan. Put the crust in your freezer until the filling is done. 4. Use an electric mixer to combine the sugar with the cream cheese, sour cream, and vanilla. Mix until smooth and creamy. Scrape down the sides of the bowl. In a separate bowl, whisk together the eggs and then add them to the cream cheese mixture. Blend until just incorporated. 5. Remove the crust from the freezer and sprinkle the white chocolate chunks on top of it. Pour the cream cheese filling into the crust. Pour dollops of the raspberry preserves around the crust in a circle. Drag a toothpick through them in order to get the swirl shown above. 6. Carefully place the cheesecake into the water bath. Bake for 12 minutes. Then, lower the oven to 350 and bake for 60-90 minutes or until the top of the cheesecake turns a light brown or tan color. 7. Remove from the oven to cool. When cool, put in the refrigerator for at least four hours or overnight.